Posted 1:00 pm by Rena Anya Devéza & filed under Alexander Technique, torn meniscus. After over two months since my knee surgery I finally was able to go back to work. At first I was feeling kind of timid. It was feeling like I was starting a new job. I found that I was receiving two sorts of welcomes…the heart felt ones from colleagues who were so happy to see me back, and the ones which were totally perfunctory. I was grateful to have been absent for so long to find out who really cared about me. Great knowledge to have! Bittersweet. And then…well…I started receiving hugs. Hugs all around! So many hugs! I cannot remember receiving so many hugs at one particular time. All day long. Some of my co-workers didn’t know where I had been. “Yo Rena, haven’t seen you in awhile. Were you in France?” “Nah…knee surgery.” One of my colleagues, who had also had had time off because of torn meniscus surgery simply said “see I told you” (that I would be out longer than the four weeks I had imagined). Wow to be surrounded by my fabulous co-workers! Amazing energy! Big shot in the arm! I had a conversation with a French guy who came in. He and I have opposite situations. His wife is American and they visit NYC twice a year. My husband was French and I visit France often. So we blabbed away in French about it all, kind of thrilled by the impromptu exchange. I told him that I had to cancel my planned January trip to Paris because of my knee situation. Oh the sales I will be missing! Hélas! And I began to again wonder about the transformation that happens in me when I change languages. A friend of mine had told me that when I speak French I flip a switch and immediately become joyful and animated. I glow. He says that it happens every time. I finally understand why. I become a different version of myself and I can actually pretend not to be me. Everything sort of shifts. I go outside of myself. I am now wondering about the psychophysical/linguistic reasons that enable this positive-ized transformation of myself. When I speak a different language I hold my jaw in a different way, I gesture a different way, even the pitch of my voice changes. Of course I speak with a totally different intonation. This New Yorker becomes parisienne. I trade one unique accent for another. I drop different syllables. Well, yet again, I was reminded how happy I am to be the de facto French translator at work! So…how do I feel now being at my “new job?” Well…I feel that I inhibit and direct with total aplomb! That’s how I feel! I feel a tad removed, and very objective about everything and everyone. It’s a great place to be in, I must say! I hear that I have really great energy. I certainly am smiling a lot! So…obviously I do not have much time for AT lessons right now. I mean, after work, I have to go home and ice my knee. I am finding that, at the end of my work day, well, my poor knee is all inflamed and stuff. Obviously I’m in for a long haul. But when I think that even two weeks prior to my first day back, I couldn’t at all stand up much, or walk much, well, I’m totally cool with my physical state of being at the moment. 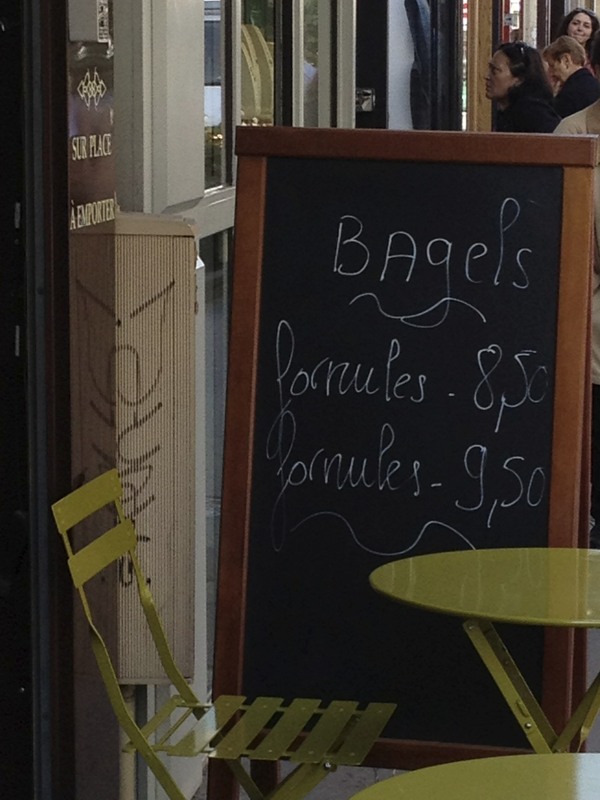 I came across a bagel café in Paris this summer but I didn’t try it. After all, I do not even bother to purchase camembert here in NYC, do I?